So when is that Holm/Smyth Summit ever gonna happen? Or did I miss it? ..... but if you’re asserting that no serial killer has ever approached the police pretending to be a witness (despite having no prior police contact), then it’s not so much “prolifling” you’re flying in the face of; its cold hard fact. I think you'll find it wasn't the normal activity of a serial killer. Generally, it is what is judged, normal that is used to support a theory - not special pleading. Leastwise, that is how legitimate theories are pursued. Why do you think debates are a competition? What logic has persuaded you that investigations are decided by a democratic process? Do you think Swanson, Abberline, Reid, asked for a show of hands before heading out for the day? Holland’s request was for the constable to leave his “fixed point” and accompany him to the Chapman murder scene, whereas Hutchinson’s story involved no such movement on the part of the copper. We don't know what Hutchinson said to the PC, or what the PC told Hutchinson to do, if anything. His next remark was "...but did not go to the police-station." Who said anything about going to the police station? Possibly the PC, and likely Abberline too. All the latter had to do - as professional duty and basic common sense dictated - was make a note of Hutchinson’s name and address along with the basic details of his story. And, you know he didn't ...because? I think you need to take another look at it. Hey, Press Search is working now - the challenge is still open to you to prove me wrong. I know you would love to be able to do that. Last time you could only come up with about 6, did you feel rushed? .....and b) even if they did, what sane and rational conclusion could you possibly draw from it? You do realise that the newspapers were reporting the same stories? It is not a case of numbers, it is a case of how widespread the reporting was. If the same story is repeated in every paper, there's more chance Hutchinson will be aware of the story. And, when repeated the next day, even more chance. Not forgetting the public will also begin to accept what they read. It was not a case of several different women called Caroline Maxwell all independently seeing the same event, with different newspapers being allocated to report on each different Caroline Maxwell! It wasn't just Maxwell though was it. M.Lewis also provided a similar story, and others at the Ringers. More than one source. As opposed to those cries of "Murder", was it 1:45, 2:00, 3:00 or 3:45? All you have to do is judge how inconsistent the times for that cry of murder were, with the various stories of Kelly being alive in the late morning - all consistent stories. This is simple, judge between "inconsistent" and "consistent" - you have five minutes......this is not difficult. You should be sure, you edited my comment in reply to your theory about serial killers who come forward as a witness. How normal was it for serial killers across the board to do such a thing? I wouldn't think it was worth waiting for. 1. Hutch never sees mary that night and is either waiting for her to return or for her guest to leave. 2. Hutch sees mary they have borrow money chat she leaves him and he shortly thereafter returns to wait for her return. In both scenarios There is no Aman. In scenario 1 the guest is probably blotchy. Also he may have waited like he said but got tired of it, left and come back an hour later 4ish and this time found her alone. If hutch wasnt her killer than i think blotchy was. Last edited by Abby Normal; 07-22-2018, 06:03 PM. If blotchy didnt kill her then i think hutch did. I think more than likely one of these men were her killer, instead of some phantom no one saw that night man. barnett was cleared and had an alibi. 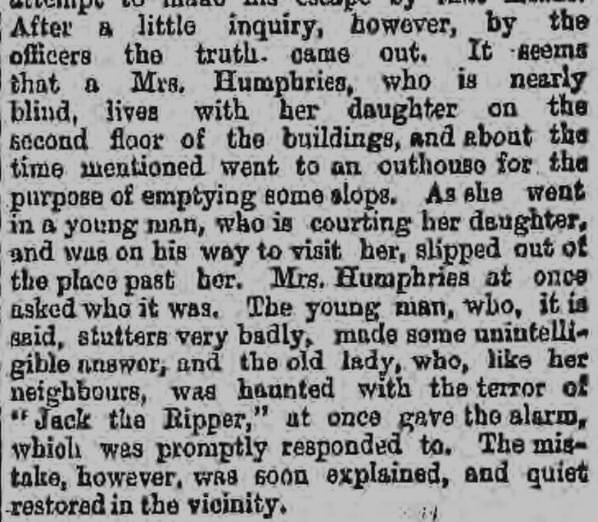 That leaves blotchy and hutch and ive got them suspects 1 and 1a for the ripper. So, when the inhabitants are known to use such a cry as a ruse to get attention, why should we assume such a cry actually meant, "murder"? And, more to the point, why would the actual inhabitants of the East End think this had to be the case? You have been answered by other posters,but I will write what I suspect.It is that the majority of Hutchinson's statement is false.There is no corobberation.AM,the trip to Romford,the waiting for three quarters of an hour outside Crossinghams,the walking the streets.Where is the proof? The evidence of Lewis is that a man was stood there about 2.30.It did not contain evidence of how long he had been there before she saw him,or how long afterwards he remained. A woman was found murdered in a room no more than about 20 yards from where that man stood.Medical evidence reported she could have been killed early that morning.No one else can be placed by information,in a more oportunist position,except the person seen by Cox.That man and Hutchinson could have been one and the same. You have been answered by other posters,but I will write what I suspect.It is that the majority of Hutchinson's statement is false.There is no corobberation.AM,the trip to Romford,the waiting for three quarters of an hour outside Crossinghams,the walking the streets.Where is the proof? There's an interesting paragraph in the Times of 12th Nov., it gives a little overview of the degree of work taken up by the detectives. "Detective-Inspectors Reid, Moore, and Nairn, and Sergeants Thicke, Godley, M'Carthy, and Pearce have been constantly engaged, under the direction of Inspector Abberline (Scotland-yard), in prosecuting inquiries, but, unfortunately, up to the present time without any practical result. As an instance of the magnitude of their labours, each officer has had, on average, during the last six weeks to make some 30 separate inquiries weekly, and these have had to be made in different portions of the metropolis and suburbs." Would you agree that this paperwork will comprise of evidence in the murder case? Where do you suppose all that paperwork is today? You ask, "where is the proof?". Why do you think it should have survived? The evidence of Lewis is that a man was stood there about 2.30.It did not contain evidence of how long he had been there before she saw him,or how long afterwards he remained. Why should it, Lewis was just passing through. Certainly, but as is often the case with charges against Hutchinson, they all stem from a lack of evidence. Yet, legitimate theories come from the known evidence (if you have been in the police, you will already know this). Hi Harry. Thanks for your response and I have always appreciated your no-nonsense approach. Yes, you are quite right. Everyone who has responded is correct. As far as we know, there is no independent evidence that Hutchinson actually lingered across from the court for 45-50 minutes. But this is precisely what has always worried me about Bob Hinton’s theory! How did Hutchinson know this? If he wasn’t lingering for 45 minutes, how did he know he was ‘in the clear’ to claim that he had been? And, similarly, if he hadn’t been, why even add this unnecessary “false” detail in his statement, if it served no purpose in implicating Astrakhan? Because, if anything, it would have left him open to being exposed, and would have unnecessarily implicated himself as a potential suspect. If Hutchinson wasn’t there for 45 minutes, anything could have happened in his absence. An unexpected plainclothes cop could have walked past. A couple of drunken night birds could have rolled in and pounded on the door of Crossinghams for 10 minutes until they were told to leave. Yet there it is in his statement. If he’s lying--and I am part of the minority that doesn't think he is--this strangely self-implicating detail must have served some other purpose. But I’m not seeing Hinton or anyone else address it. That’s why I posed the question. By contrast, I am impressed that Wickerman is trying to see these events in “real time” and even tries to get inside Hutchinson’s head to explain his subsequent actions. A useful discussion. Thanks. "The court is being held in a small committee-room on the ground floor, a place altogether inadequate for so important an inquiry." There are three committee rooms on the link I posted earlier: large, medium and small. I don’t want to repeat myself, so I will just humbly suggest that you reread Keppel. Ridgway couldn’t have “injected” himself into the investigation in March 1984 because he WAS the investigation in March 1984. The police had previously initiated contact with him four times and gave him a polygraph. Any reasonable definition of “injecting” oneself into an investigation, as it relates to Hutchinson, would involve someone off the radar coming forward and trying to insinuate themselves into the investigation in a significant way, thus risking drawing attention to themselves. Current suspects need not apply. So, personally, I reject Ridgway as a useful comparison. Ditto Chikatilo. Every witness to come forward to contact the police is injecting himself into an investigation. 100% of the time. What similar % can you give for murderers coming forward? 1%? 8%? 0.03%? What worries me about profilers like Douglas is they always use anecdotal evidence, and almost none of it is open to independent verification. That worries me, and I would hope that it worries you. Too many blanket statements. Too many claims without hard data. But I will leave it at that. Thanks for the conversation. Cheers. he said he was there for 45 minutes because he was there. waiting for Mary to come home or perhaps for her guest to leave who was probably blotchy. aman didn't exist.